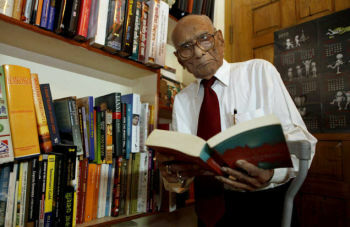 Freedom fighter Bholaram Das marked his 100th birthday this weekend by announcing that he was going back to school. Das has enrolled in a PhD program at Guwahati University in the northeastern state of Assam – making him perhaps the oldest university student in this country of 1 billion. Das was 19 when he was jailed for participating in a 1930 protest against British rule. He spent two months doing hard labour and went on to study commerce and law. In 1945, he joined the Congress Party that led India’s drive for independence, achieved in 1947. Das worked as a teacher, a lawyer, a magistrate and a district court judge before retiring in 1971. With his wife Mandakini, he had five sons and a daughter. For his doctorate, Das plans to study a subject close to his heart – how his native Bohori village helped in the spread of neo-Vaishnavism, a liberal and monotheistic stream of the Hindu religion credited with breaking down social divisions in Assam, one of India’s easternmost states. The centenarian said he wanted to pursue his interest and belief in the religion’s philosophies of one God and humanism. “It is indeed rare to find a student who is 100 year old,” said the university’s vice chancellor, O. K. Medhi. Das, who now has 10 grandchildren and a great-grandchild, is being advised in his studies by one of his granddaughters, a university professor, and other family members. His wife died in 1988. Larry Page, what is responsible for your early progress in life? How did you get to where you are so quickly? Larry Page: I think I was really lucky to have the environment I did when I was growing up. How do you think you knew at such an early age that you wanted to be an inventor? Larry Page: I just sort of kept having ideas. We had a lot of magazines lying around our house. It was kind of messy. So you kind of read stuff all the time, and I would read Popular Science and things like that. I just got interested in stuff, I guess, technology and how devices work. My brother taught me how to take things apart, and I took apart everything in the house. So I just became interested in it, for whatever reason, and so I had lots of ideas about what things could be built and how to build them and all these kinds of things. I built like an electric go-cart at a pretty early age. It’s as if computers were the toys of your childhood. Larry Page: Yeah, basically, and electronics too. You mentioned reading magazines like Popular Mechanics. What else did you read that might have influenced or inspired you in some way? Larry Page: I read all the computer magazines and things like that, and I was sort of interested in how these things really work — anything having to do with the mechanics behind things, either the mechanics or the electronics. I wanted to be able to build things. Actually, in college I built an inkjet printer out of Legos, because I wanted to be able to print really big images. I figured you could print really big posters really cheaply using inkjet cartridges. So I reverse-engineered the cartridge, and I built all the electronics and mechanics to drive it. Just sort of fun projects. I like to be able to do those kinds of things. You certainly have an aptitude for it. Is this because of your early education or your parents? How do you explain that? Larry Page: Actually, my brother was nine years older than me, and he went to Michigan as well. He brought home some of his labs for electronics and things like that, and sort of gave them to me. I learned how to do the stuff. I think there were a lot of lucky things like that. You seem to have had no fear of any of this. Where does this self-confidence come from? Larry Page: I think that’s true of kids today as well. If you have access to these things at a really young age, you just become used to it all, and it is natural to you. Kids certainly don’t have fear of using computers now. It’s the same kind of thing. If you grow up in environments where you have ICs (integrated circuits) lying around, you don’t have fear of that either. And here you are now, a CEO at what age? Why is it that you perceived the need for Google before anyone else did? Larry Page: Well, it’s actually a great argument for pure research because… So anyway… Search engines didn’t really understand the notion of which pages were more important. If you typed “Stanford,” you got random pages that mentioned Stanford. This obviously wasn’t going to work. Larry, you’re a CEO at 27. What challenges or frustrations have you experienced at reaching this station at such a young age? Larry Page: I think the age is a real issue. It’s certainly a handicap in the sense of being able to manage people and to hire people and all these kinds of things, maybe more so than it should be. Certainly, I think, the things that I’m missing are more things that you acquire with time. If you manage people for 20 years, or something like that, you pick up things. So I certainly lack experience there, and that’s an issue. But I sort of make up for that, I think, in terms of understanding where things are going to go, having a vision about the future, and really understanding the industry I am in, and what the company does, and also sort of the unique position of starting a company and working on it for three years before starting the company. Then working on it pretty hard, whatever, 24 hours a day. So I understand a lot of the aspects pretty well. I guess that compensates a little bit for lack of skills in other areas. It appears that it’s people of your generation who have really introduced the so-called “24/7 mentality.” Are you aware of that? Do you think that accounts for your success? Larry Page: I think it definitely helps to be really focused on what you are doing. You can only work so many hours, and I try to have some balance in my life and so on. I think a lot of people go through this in school. They work really hard. You can do that for part of your life, but you can’t do that indefinitely. At some point, you want to have a family. You want to have more time to do other things. I would say that it is an advantage being young. You don’t have as many other responsibilities. Larry Page: I think I am really lucky. Being in the Bay Area, a lot of my friends have started companies that have been quite successful at different stages. So I go up to San Francisco and I hang out with my friends, and we talk about their companies and all sorts of different things. It is fun, but it is also work in some sense. I think within Silicon Valley there is really a mix of recreation and work a lot of times. Where do you go from here? What do you see yourself doing in ten or 20 years? Larry Page: Artificial intelligence would be the ultimate version of Google. So we have the ultimate search engine that would understand everything on the Web. It would understand exactly what you wanted, and it would give you the right thing. That’s obviously artificial intelligence, to be able to answer any question, basically, because almost everything is on the Web, right? We’re nowhere near doing that now. However, we can get incrementally closer to that, and that is basically what we work on. And that’s tremendously interesting from an intellectual standpoint. We have all this data. If you printed out the index, it would be 70 miles high now. We have all this computation. We have about 6,000 computers. So we have a lot of resources available. We have enough space to store like 100 copies of the whole Web. So you have a really interesting sort of confluence of a lot of different things: a lot of computation, a lot of data that didn’t used to be available. From an engineering and scientific standpoint, building things to make use of this is a really interesting intellectual exercise. So I expect to be doing that for a while. On the other hand, I do have a lot of other interests as well. I am really interested in transportation and sustainable energy. For fun, I invent things on the side, but I don’t really have time to follow up on them. What do they think of people like you at Stanford and Michigan? You are extraordinary people they’re sending out into the world. Larry Page: Well, thank you. It was kind of strange for me. I went back to Michigan and there was all this faculty who wanted to meet with me. It was just very strange, going from a student to that. At Google, especially, we are really lucky. Everybody is our product! Or it’s starting to be everybody. No matter who you talk to, they’re like, “Oh, Google today was great. I found exactly what I needed.” Somehow we’ve done a really good job. People are really happy with our company, and we have provided pretty good service. So that sort of transfers onto how people interact with me as well, which is really nice. It used to be that a Ph.D. candidate hoped to have his or her dissertation published in some obscure academic journal. Your dissertation started a company and launched you on a career. Larry Page: There are a lot of students at Stanford who have started companies based on their research work. I think Stanford does a pretty good job with that. There is obviously a lot of infrastructure, but also there is an acceptance of it, which I think is good. Larry Page: There is sort of a joke that faculty members have to start a company before they get tenure. I don’t think that’s quite true. The faculty are very focused on what is going on in the world, which I think is a good thing. The danger is if you’re not doing research because you are pushed into things that are just practical. Larry Page, what do you see as the responsibilities that go along with success and the accumulation of wealth that we are seeing in Silicon Valley today? Larry Page: I think there is tremendous responsibility. If I was not in this situation, my biggest concern would be the concentration of wealth and power in a very small number of people. On the other hand, it is nice to be rewarded for what you do. There are a lot of things I would like to do in the world that having a lot of resources would really help with. Larry Page: I have been really interested in applying technology to transportation. I don’t think that has really been done. Making cars better. There are a lot of interesting systems people have designed that basically are small monorails that run along sidewalks, and that route you exactly where you want to go. Some of these things are actually quite practical. As a side interest, I have kind of followed this stuff. When I was in Michigan, I tried to get them to build a monorail between central and north campus, because it is only a two-mile trip, and they have 40 full-sized diesel buses that run back and forth. Two miles! So that’s a prime candidate for new transportation. Is there any reason for you to go back to Stanford and finish your degree? You have taken leave of absence from Stanford to be a CEO. Why bother to go back at all? Larry Page: Well, I think Stanford is a really great place. There’s really, really smart people around, and it’s really a fun place to be. Some people from other startups have gone back when things sort of calmed down. So it does happen. There are things I want to work on that are very speculative, and Stanford is a great place to do things like that. I didn’t start out building a search engine. I just said, “Oh, the links on the Web are probably interesting. Why don’t we try doing something with that?” I was pretty lucky that it was a useful thing to do. If you’re doing something you’re not sure is going to work at all, a company probably isn’t the right place to be doing it. Having incredibly bright people around to work with is a really nice thing. I could see going back for that purpose.